Akintunde Ibitayo (Tayo) Akinwande is a Professor in the Electrical Engineering and Computer Science Department of the Massachusetts Institute of Technology, Cambridge, MA. Professor Akinwande received a B.Sc. (1978) in Electrical and Electronic Engineering from the University of Ife, Nigeria, a MS (1981) and Ph.D. (1986) in Electrical Engineering from Stanford University, Stanford, California. Professor Akinwande joined Honeywell Inc. in 1986 where he initially conducted research on GaAs Complementary FET technology for very high speed and low power signal processing. He later joined the Si Microstructures group where he conducted research on pressure sensors, accelerometers, thin-film field emission and display devices. Professor Akinwande joined MIT’s Microsystems Technology Laboratories (MTL) in January 1995 where his research focuses on micro-fabrication and electronic devices with particular emphasis on smart sensors and actuators, intelligent displays, large area electronics (macro-electronics), field emission & field ionization devices, mass spectrometry and electric propulsion. 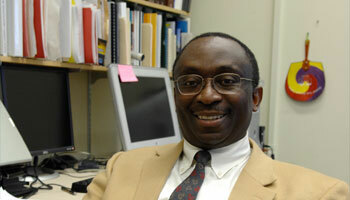 Prof. Akinwande is a recipient of the 1996 National Science Foundation (NSF) Career Award. He has served a number of technical program committees for various conferences, including the Device Research Conference, the International Electron Devices Meeting, the International Solid-State Circuits Conference, the International Display Research Conference and the International Vacuum Microelectronics Conference. Professor Akinwande holds numerous patents in MEMS, Electronics on Flexible Substrates, Display technologies and has authored more than 100 journal publications. He was a visiting professor at the Cambridge University Engineering Department and an Overseas Fellow of Churchill College in 2002-2003. He is a current member of the IEEE Nanotechnology Council. Microstructures and nanostructures for sensors and actuators, and vacuum microelectronics. Devices for large area electronics and flat panel displays.